I recently saw this print on Facebook and ordered it for my husband as a gift. I thought it would be a great daily reminder to him (and me!) about what truly goes into running a successful business and being a successful person. Oftentimes, it’s easy for others to see only the success and not all the other nitty-gritty pieces needed to achieve that success. Matt has always been a driven person. 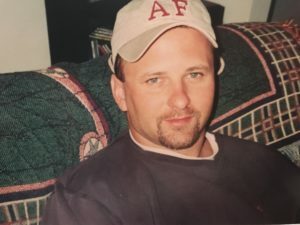 When I first met him 20 years ago, he was an associate at a busy dental practice here in Duluth. He had already purchased his first house on his own, owned a reliable vehicle and was paying all his bills on time. He had completed his dental education and was successfully working in his desired field. He had goals and plans, big dreams you might even say. He surprised me with his determination and drive even then. 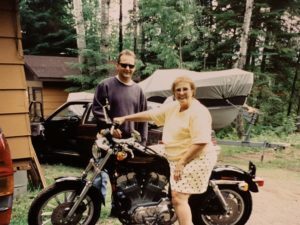 Dr. Matt and his mom showing off his Harley Davidson motorcycle in 2000.
from Dr. Carter Johnson. At the time, the price of the dental practice and the monthly rent for the office space in the geodesic dome was daunting. Plus, he now had new expenses, such as payroll for staff and lab bills, that required a steady income. If Matt’s schedule wasn’t full, the office wasn’t making any money. Money was tight some months, he scraped and made do, often taking as little take-home pay as was possible, while still being able to pay his personal bills. There were no exotic vacations, no new cars. All our time and energy went into keeping and maintaining the dental practice. Slowly, we got into a comfortable groove. The practice schedule became steady and full. The daunting payments became easier and there even was a little money for a splurge here and there. 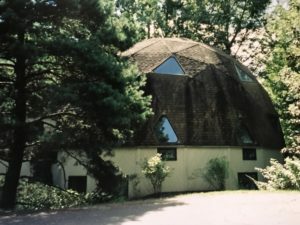 The dome, the original home of Pike Lake Dental Center, in 2000. Matt quickly found owning a small business wasn’t exactly glamorous. If it snowed, he needed to shovel and salt the walkways. If a piece of equipment broke, he needed to fix it or pay someone to fix it. 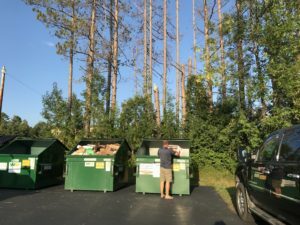 He needed to form new relationships with many people, such as the garbage company, the snow plowing company, the dental supply company and his landlord. Back in the dome, if it rained, we spread containers throughout the office to collect the leaks from the roof. It wasn’t always pretty, but it had Matt’s name on it and that fact alone made the jobs easier. Pride of ownership does have its benefits. Dr. Matt at the Canosia Twp. recycling center. Some of the other “hidden” jobs of being the owner at Pike Lake Dental Center include plowing the walkway between the employees parking lot and the office, deep cleaning the office, salting and shoveling the sidewalks with each new snowfall, contracting maintenance services for the office, changing light bulbs, hiring staff, putting up and taking down Christmas decorations, making purchase decisions, and every day business decisions. These may not seem like large jobs, and most of them aren’t, but they help create a 24 hours a day, 7 days a week, 365 days a year job. When it came time to build our existing office in 2004, Matt took an active role in the planning and design of the building. We’d check in with the builders many times a day. It was a HUGE investment for us and it was a leap of faith. The building project seemed enormous and required many new items, like dental chairs and computers, which only added to the final price tag. When we sat down and looked at the final numbers after the building was complete, I was shocked. How in the world would we pay it back? Matt knew, though: determination and hard work. 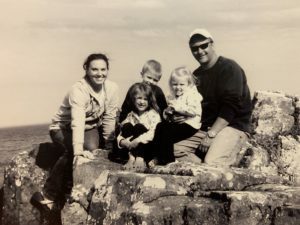 The young Jugovich family, 2009. I can attest to many sleepless nights, spent worrying and number-crunching. Through sheer will and determination, he made every single payment on time and in full. He would not let Pike Lake Dental Center fail. Looking back, I am still amazed at his tenacity and I’m incredibly proud of all he’s accomplished. When he was worried or stressed, no one else knew. Ok… I knew, but our patients and employees didn’t. He was the same friendly, professional Matt. 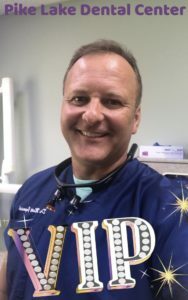 He alone shouldered the incredible stress and financial responsibility for not only his own young family’s well-being, but also the well-being of all the staff members and their families depending on Pike Lake Dental Center for a steady income. I would never say the success of Pike Lake Dental Center is on Matt’s shoulders alone. It most definitely is a team effort. I truly believe that every person employed at our office helps make it a success. Part of it is hiring the right people with the right attitudes and work ethic. Part of it is his lead by example leadership style. 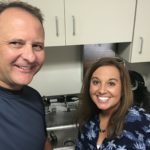 I’ve heard Matt say many times throughout the years that he wouldn’t ask someone to do a job he himself wasn’t willing to do, even if that means jumping in with sterilizing instruments when we are short staffed. I’ve felt many times, as we go into work after hours or deal with work related issues on our days off, that we are married to this office. Without realizing it, Pike Lake Dental Center has become who we are. It is us and we are it. I also believe that is a huge part of what makes it a success. When we leave for the night, even though the doors are locked, we take Pike Lake Dental Center home with us. 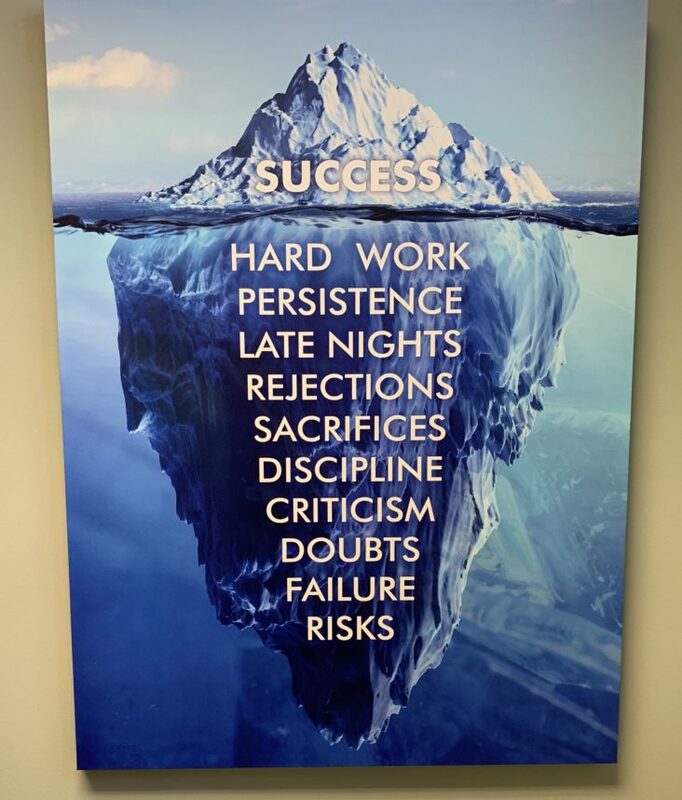 To me, that is the foundation of success.